General Mills changed the damn cereal game when it unleashed limited-edition boxes of marshmallow-only Lucky Charms in late 2015. Now, it's changing up the cartoon leprechaun's sugary cereal in a big way again -- this time, with an all-new instant oatmeal version along with a similar version of your other favorite cereal, Cinnamon Toast Crunch. 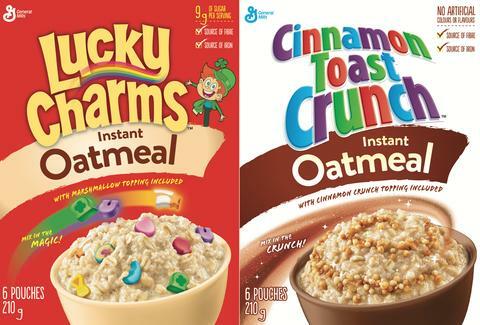 Unfortunately, there's a slight catch: both the Lucky Charms and Cinnamon Toast Crunch oatmeals are only available in Canada for a limited time, a General Mills spokesperson said via email. They're currently available at most retailers across the country for about $3.50 and will be on shelves for about eight weeks. Worse yet, the company said it currently has no plans to release the products in the US, but if you're visiting Canada sometime in the near future or know somewhere there who owes you a favor, well, you know what to do. Tony Merevick is Cities News Editor at Thrillist and is more interested in the Cinnamon Toast Crunch version. Send news tips to news@thrillist.com and follow him on Twitter @tonymerevick.